From the outside looking in, my business is a one woman-operation. I’m a solopreneur on a tight budget. So in addition to writing and editing for my clients, I’m responsible for every other facet of my brand. I am the receptionist, the accountant, the marketing director, the social media manager, and the customer service representative. The buck always stops with me. On top of all that, I still have to be a good wife, daughter, and friend. It’s a lot to juggle, but I put on my big girl pants and make it work. Let’s be real, though, if even major corporations need an advisory board to keep them on track, every epic fab girl should have one too. That’s why I choose my friends wisely. The women in my inner circle are more than friends. They’re reliable, purpose-driven women who motivate and support me in every area of my life. When tough decisions have to be made, doubts need to be conquered, or a wake-up call is in order, I can always count on them to steer me right. I owe so much of my success to the support and advice these women (along with my mother and my husband). In fact, I would encourage any woman in pursuit of her purpose to check her circle and make sure the people around her can be counted on to push her towards her greatness. 1. They have a purpose of their own. As cliché as it may be, iron does sharpen iron. If your girls are sharp, slacking off isn’t even an option. When the women around you are pushing towards their own goals, even goals that are entirely different from yours, they’ll call you higher without ever having to say a word. But trust me, they’ll have lots to say because purpose-driven women love to see others do well and they’ll push you to be your best self. 2. They respect your goals and celebrate your wins. A person who doesn’t want you to win can’t help lead you to your purpose. Good friends are fans of your work. They’re eager to help you secure new opportunities that will get you closer to your goals. They speak highly of you, even when you’re not around. This is key, especially when doubt creeps in because they’ll be the first to remind you how great you are. 3. They understand the meaning of grit and hustle. Quitters can’t teach you perseverance. Keep them at arm’s length. Instead, surround yourself with women who understand that sometimes you have to skip an outing or stay up until 3 am to get things done. They know the value of sacrifice and the importance of learning from failure. When you need help pushing through your discomfort, they’ll have your back. 4. They know self-care is important. It’s easy to get so caught up in the juggling act of life, work, and relationships, that we forget to slow down. Make sure you’ve got friends who know that all-nighters must be balanced by lazy Sundays and who aren’t afraid to steal you away for manicures and mimosas. 5. They’re not afraid to keep it real. An advisor who’s scared to tell you when you’re wrong is as useful as flip-flops in a snowstorm. Cute as they may be, you’ll end up in pain. The friends that make good advisors are the ones that will serve it up straight. If you’re making bad decisions in love, life, or business, they’ll firmly (but lovingly) set you right. 6. They’re just like you, and nothing like you. I’m a married, full-time creative entrepreneur with anxiety issues and a bad case of perfectionism. Not all of my friends are exactly like that (thank God!). I share at least one of those characteristics with each of them, but we differ in so many ways. Similarities make it easier for them to understand me and our differences mean I’m challenged with perspectives other than my own. That balance is key. Above all else, when you look at your circle of friends, what you should feel is love, support, and trust. Don’t be afraid to distance yourself from people who don’t give you that. And if there are gaps in your circle, be open with your soul and goals, and trust that the people you need will come to you. You’ve got a tough enough job juggling everything it takes to reach your purpose. 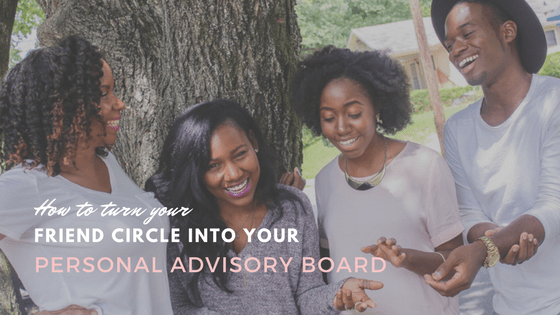 Make sure the women in your corner can be the personal advisory board that makes that job just a little bit easier. Talia is passionate about helping women tell their stories and speak their truth as a copywriter for small businesses and personal brands and ghostwriter to CEOs eager to establish their expertise through writing. Other than a laptop and a story to tell, the keys to her heart: seafood, literature, and killer shoes.